You know how all the bigtime Android iterations are named after desserts? Do you also see how the titles of these deserts have been released in alphabetical order? These Android titles go like so: Cupcake, Donut, Eclair, Froyo, Gingerbread, and Honeycomb. This last version is the first tablet-specific version of Android and should, based on what we know at the moment, be considered as being developed aside from the main Android bloodline. 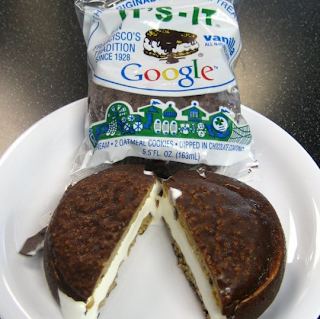 That said, the next version’s name has been “leaked” by a Google developer by the name of Romain Guy: Ice Cream Sandwich. Tasty enough? Totally tasty. Then of course there’s the most empirical evidence of all: if there were to be a giant Froyo sculpture out in front of the Googleplex and there were to be a giant dish of Ice Cream, there would be some confusion. If the Ice Cream is a big sandwich instead, all of that confusion just melts away like the tasty, tasty treat it is. ALSO, the hero image in this post comes from Google circa 2006. Still yummy.